Eyewitness accounts: Wreckage from the two Provosts showered down over the village but was mainly confined to several locations along Main Street, Governors' field and the playing fields on Lingwood Lane. One plane cart wheeled across the sky and landed in the orchard at the top of Roe Lane and burst into flames. 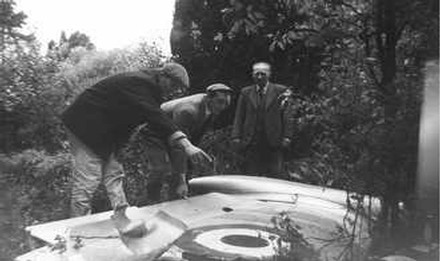 A wing from the second aircraft fell into the Manor House garden near the road and the tail section ended up in the dyke behind the old vicarage. As can be seen left, a fuel tank from the end of one of the wings landed at the side of Mr. Walter Hill's butchers shop on Main Street, opposite the church. The second fuel tank crashed on to the school playing fields. The other tail section was found near Lowdham Grange borstal. 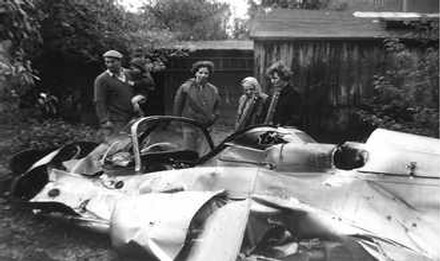 The cockpit descended from the sky in to a farmyard narrowly missing Foxwood House. This caused Mr. Joseph Robinson, who was walking along the road nearby to dive into the ditch. 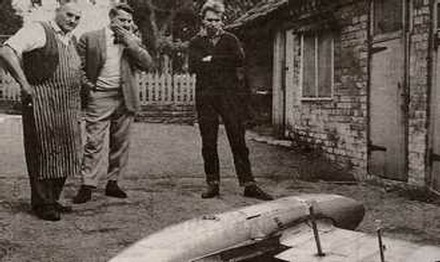 One pilot, seen by David Rose and John Tew, parachuted on to the Manor Farm roof and narrowly missing spiked railings. David Rose helped him out of his harness and drove him in a Land Rover to the field near the bungalow of Mrs. Joan Russell (opposite Woodborough PO & News), where the second pilot had come down. The second pilot was being cared for by Mrs. Russell, who asked him if he would like a cup of tea, but he was more concerned about the safety of his fellow pilots. 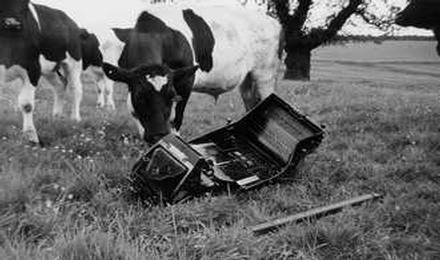 The third pilot landed in Ploughman Wood near to Lowdham Grange borstal. 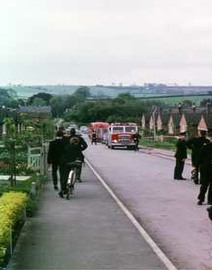 The photograph on the right shows fire tenders and crew with police officers outside the Old Peoples bungalows on Roe Hill near to where other debris was found. Mr. Sinfield, the school headmaster, shepherded fifteen school children into the safety of the school building. He said, "pieces of wreckage came flying down all around, miraculously none of the children were hurt." was delivering mail when one house occupant remarked, "Look at those, they are very close. They will crash if they are not careful." The next second they had collided. Private William McClumpha, batman to Major General C M M Mann, saw the parachutes and jumped into a Land Rover and went to pick up the parachutists. Mrs. Maria Rose was bathing her new born baby girl, Sarah, when her three year old son, Stephen, came running into the bathroom and said he had seen a man jump out of a plane and there had been a crash. Shirley Massey, whose husband worked at the Lowdham borstal, was with her friend Barbara Morris when they heard a bang and saw a ball of smoke in the sky. Mr. J. Timmerman saw fragments floating around and three parachutes open out. He said, "It sounded like a plane was breaking the sound barrier." Ten-year-old model plane enthusiast, Jim Jackson, had a grandstand view of the crash and described how he saw two planes doing aerobatics and loop the loops, then touch wings and catch fire in mid-air. Wilf Hall of Roe Lane said he was at work in Calverton Colliery, driving a locomotive, when he saw the crash. He told his foreman what had happened and was allowed to go home. Four scenes of wreckage in and around the village. Mr. Walter Raynor, who was a special constable, was one of the first on the scene along with Michael Grundig. When they reached the burning wreckage it was such an inferno that no-one could get near it. The vicar of Woodborough, Reverend Ross Hayward said, "We must have guardian angels above Woodborough, it is a miracle no-body was hurt." All the pilots were taken to hospital, but none had any serious injuries. Given that it was such a busy time of day and children were on their way to school it was amazing that no one was injured. The only damage was to some roof tiles on a few of the buildings and aviation fuel spillage over a large area. A thanksgiving service was held at St. Swithun's Church that evening and a small commemorative plaque was later placed in the church. As part of the village Millennium celebrations in 1999, Mrs Shirley Hoskins wrote and produced a pageant, which covered the history of the village from Roman times to present. The final act of the pageant featured events of that day in 1966, with some of the original eyewitnesses being able to recall their own account of the crash. The official view: The following has been taken from a letter dated 9th December 2002 to the Newark Air Museum Ltd following their enquiry for information about the incident to the Air Historical Branch (RAF), Ministry of Defence, Stanmore, Middlesex. This letter therefore represents the official view of the accident from RAF investigations undertaken following the incident in 1966. It is reproduced here by kind permission of the Newark Air Museum. Jet Provost T4 Serial No. XP631, No. 2 Flying Training School, based at RAF Syerston. This aircraft was piloted by Flight Lieutenant D. Henderson and was the leader of a formation of four aircraft practising aerobatic sequences. The team completed a bad weather sequence and then climbed through cloud breaking at just over 4000 ft. The formation then flew over almost 8/8 cloud, until a large gap was seen and here a fair weather sequence was flown down to a height of about 4,800 ft, level with the cloud tops. The formation then flew to a larger gap in the cloud about 6 miles northwest of Syerston but decided to return to the previous area. The fair weather sequence was then continued during which a loop in Big T formation was entered, off the bottom of which the aircraft pulled up into a shallow climbing turn to the left with 50 degree bank; as the turn was established 'T' formation was converted to a single 'Card 4'. At this stage, this aircraft was struck by XM384 (not one of the formation), the starboard wing and tank sheared off, aircraft decelerated and rotated to the left. The pilot ejected and the aircraft struck the ground. The aircraft was a write-off but the pilot was uninjured. Jet Provost T3 Serial No. XM384, 2 FTS. This aircraft was taking part in dual instruction session with Flying Officer Tim G Thorn instructing Pilot Officer D H ‘Mike’ Sedman. Immediately on breaking cloud, after lowering his visor, the student saw a formation of aircraft slightly below at 11 o'clock. He shouted a warning to the instructor, who saw the aircraft and pulled hard back on the control column. This aircraft 'G' stalled through the rapid increase in angle of attack and at the same time the leader of the formation collided with it from below. 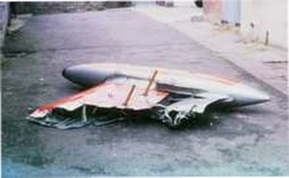 The port wing sheared off, also the fuselage just aft of the main jet pipe. Aircraft entered a flat spin to the left and both pilots ejected. The aircraft was a write-off but both pilots were uninjured. Jet Provost T4 Serial No. XP617, 2 FTS. This aircraft No. 2 in the formation of 4 aircraft and was piloted by Pilot Officer W B Aspinall. The pilot had just adopted a line astern position on his No. 1 when he saw it yaw about 20 degrees left and heard the sound of a collision. No. 1 then moved back and down towards this aircraft, the pilot ducked and the leader collided with him, although not violently. This aircraft then went into a shallow dive with just over 90 degrees of left bank. The pilot recovered control of the aircraft, which had a large hole in the left side of the canopy, returned to base and landed. The upper fuselage skin had been scorched by jet efflux and starboard side of nose door was dented. The findings were that the accident occurred due to poor airmanship on the part of the Leader of the Formation in failing to keep sufficiently clear of the climbing lane while practising formation aerobatics. There were no casualty cards for any of the personnel involved, and we do not hold any personal details. On Thursday 26th May 1966 at 8.46am. 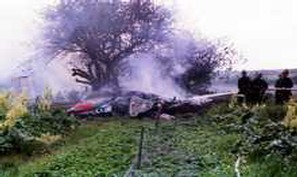 two Jet Provost training aircraft, both from RAF Syerston, collided over Woodborough. One of the aircraft had been leading a formation of planes practising aerobatics and the other plane had been taking part in a dual instruction session. The leading aircraft also hit the number two Provost, which fortunately managed to fly back to base. 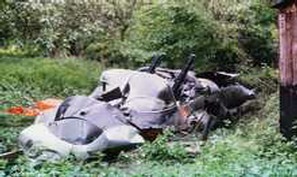 (The above photograph depicts one of the Jet Provost planes that crashed. Ed).